EASTON, PA (July 20, 2010) – More than 200 high school football players from 12 schools participated in the New York 7-on-7 Championship on Saturday, July 17 at St. Anthony’s High School. The event raised more than $10,000 for Lauren’s First and Goal Foundation, which benefits pediatric brain tumor research. “We are so thankful to Coach Rich Reichert and the entire St. Anthony's High School family for all their hard work, generosity and support in bringing Lauren's First and Goal to Long Island,” said Marianne Loose, who created LFG with her husband John in honor of their 13-year-old daughter Lauren, a pediatric brain tumor survivor. “The 7-on-7 style tournament is a dynamic new format for LFG and an exciting way for high school teams to showcase their talent and foster friendly competition among players. We are grateful to all of the high school coaches and teams who traveled to participate and make this inaugural event such a success,” she added. 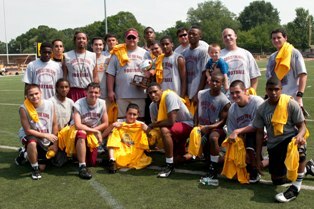 Christ the King High School from Middle Village, N.Y. won the tournament and took home the traveling trophy. Cheshire Academy, of Connecticut, finished in second place. The other schools that participated were St. Anthony's, Kellenberg Memorial, Hauppauge, Walt Whitman, Roosevelt, Cardinal Hayes, Holy Cross, Amityville and Xaverian. The event also included an offensive/defensive line clinic. High school football camps are the primary fundraiser for the foundation, although this is the first 7-on-7 event. Two one-day camps staffed by volunteer college coaches were held in June in Pennsylvania and Ohio and attracted more than 2,000 high school players and helped to raise more than $80,000. The proceeds from the camps are directed to financial support for brain tumor research and cancer services, financial and emotional support to families living with pediatric cancer, and increasing awareness of the disease. Since its creation in 2004, the foundation has raised more than $1 million, including almost $250,000 this year. Nearly 10,000 student-athletes have attended Lauren’s First and Goal camps.